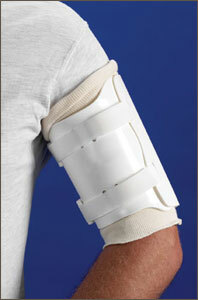 Designed for management of non-displaced humeral diaphyseal fractures, this type of Orthosis provides tough, cast-like rigidity and soft tissue compression for functional fracture management. The custom-made device controls humeral segments while allowing motion at the Surgeon’s discretion at both the shoulder and elbow joints with comfort and hygiene. This is a custom-made Orthosis, made from a cast model of the patient’s arm. The mold is used to construct an Orthosis out of semi-rigid plastic that is rigid enough to stabilize the humerus, but is flexible enough to apply without difficulty. The material is also easily modified to accommodate any changes in volume due to a reduction in swelling and muscle atrophy.